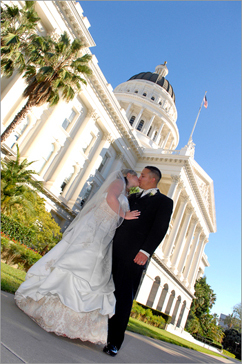 The historic capitol of California, Sacramento offers a large variety of gorgeous locations for your wedding photography session. Begin your excursion into Sacramento at the California State Capitol Museum, located in the heart of downtown. Your wedding photographer can organize a portrait of the bridal party on the Capitol building steps or on the lawn in the foreground beside the fountain. The arches at the building's entrance will serve as a great backdrop for a photo of the bride and groom. As you enter the Capitol building, you will be greeted by the magnificent marble Rotunda. A frequent ceremonial site, the rotunda will provide a beautiful space for group photos or individual portraits. After you finish your photo shoot at the Capitol building, explore the surrounding Capitol State Park. The park offers 40 acres of vibrant gardens, lush green lawns, and winding walkways. Have your wedding photographer arrange a photo of the bridal party on one of the finely landscaped lawns. Take your time strolling along the walkways as your photographer captures all of the colorful flora in the background. For an intimate portrait of the bride and groom, your photographer can have the couple pose standing beside the central fountain or seated on one of the park benches. Once you've explored the Capitol Museum, take a short walk to the stunning Cathedral of the Blessed Sacrament, located only a few blocks away. The cathedral's front steps are a great place to assemble a gentlemen's photo or a girls-only shot. The bride and groom can embrace beneath the arched entrance, with the large wooden doors as a backdrop. As you enter the cathedral, prepare to be amazed by the ornately decorated interior and its elevated dome ceiling. Your photographer can organize a portrait on the altar steps or between the pews, with tinted light from the stained glass windows flooding in. Your wedding photography session in downtown Sacramento will surely be an unforgettable one! For a picturesque wedding photography session in the center of Sacramento, start off at the Crocker Art Museum, located only a few minutes away from both downtown and the riverfront. At the museum entrance, your wedding photographer can situate the bridal party along the front steps and the bride and groom can pose for a private photo in front of the wooden doors beneath the arch. Once inside the museum, your wedding photographer can organize the groomsmen and bridesmaids along the descending spiral staircase for a great portrait. The second floor balcony is also a perfect spot for a portrait of the happy couple. Having finished your photo shoot at the museum, have your limousine driver take you to Sacramento's beautiful Tower Bridge, which crosses the Sacramento River. An iconic symbol of the capitol, this gorgeous structure is a popular location for wedding photography, particularly for intimate portraits. 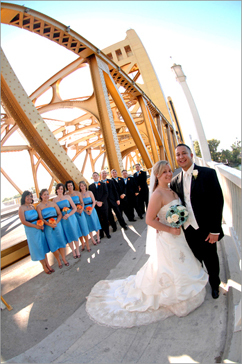 The yellow-ochre bridge, combined with the flowing Sacramento river beneath, will create a great backdrop for your wedding photos. Finally, cross the Tower Bridge over to Riverwalk Park, a 7.5 acre trail that runs along the western bank of the Sacramento River. As you meander along the trail, pause and take photos on the verdant lawns or beneath the shade trees that border the trail. You will eventually reach the Grand Staircase, along which your wedding photographer can organize the bridal party with the river serving as a backdrop. Go a little farther and you'll reach the majestic pyramid-shaped Ziggurat Building, another excellent spot for some snapshots. You'll definitely enjoy your wedding photography session near the famous Sacramento River!